« XBox 360 to support Twitter and Facebook. Who's the biggest social network on TV now? On that note, Marc Allera, director of sales and marketing at 3 UK, tells Reuters that the data usage via social networking services for customers of the INQ1 is three to four times higher than from other phones and is likely on par with Apple’s iPhone, a considerably more expensive device. Sixty five percent of INQ1 users are said to be using Facebook on a regular basis and fifty percent using Windows Live Messenger: “On usual smartphones the Internet experience is in no way close and their price is 3-4 times higher.” Again, I’m not too surprised. I don’t have any stats to prove it, but I’ve long believed that 90% of mobile phone owners probably only use about 10% of the device’s features. That’s unlikely to be the case with the INQ1, which not only concentrates on three of the most popular web services – Facebook, Skype and Windows Live Messenger – but integrates them in a very practical and intuitive way. Whether or not Twitter alone warrants its own handset is another matter, and I suspect that any new divice will incorporate additional social networks and other web services as is the case on the existing INQ1, and instead will be largely differentiated by marketing alone and, perhaps, a different form factor. 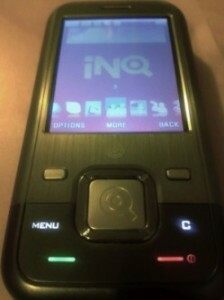 A QWERTY keyboard would be a welcome addition to a INQ Twitter phone, although perhaps I’m just old school. Kids around these parts don’t seem to have any problems conversing via T9 on a traditional number pad.